Here is a short excerpt from my next book for young readers, How NOT To Time Travel. On the Thursday on which our story begins, the gym at Sydney Newman Middle School was full of students who, ordinarily, would have preferred to stay as far away from the gym as possible. Normally, the gym brought them nothing but pain, misery and torture of both the physical and psychological variety. Today, however, the gym was the site of the Annual Science Fair. Instead of portable soccer nets, orange plastic cones and large, metal bins full of basketballs, the room was full of long, folding tables on which the eager young scholars had set up their projects, waiting for the judges to come by. The sole remaining vestige of gym class still looming over the students’ heads was Coach Hartnell who was, for reasons passing understanding, serving as one of the Fair’s judges, along with Mrs. Troughton, the science teacher, and Assistant Principal Pertwee. This intimidated the students a little, but they took solace in the fact that, in his capacity as judge, Coach Hartnell would not be able to throw dodgeballs at them or force them to run a lap. The three judges walked down the lines of tables, inspecting the projects, asking the students for demonstrations and making small, discreet notes on their clipboards. Occasionally they would make vaguely encouraging comments like “very nice” or “good effort” regardless of whether the project had any chance of winning or not. Then they got to Hugo’s project. Hugo Wells—the twelve-year-old hero of our story—was a genius. And I mean that literally. Lots of people use the word “genius” to describe everyone from professional rappers to dogs who can stand on their back legs. But Hugo was an honest-to-goodness, genuine, bona fide, true blue genius of the highest order. Oddly enough, this would be the first year Hugo ever took part in a science fair. I know, it sounds weird. You’d think someone that clever would leap at the chance to enter and win the Science Fair. But Hugo just wasn’t into it. Like many people who are highly intelligent, Hugo found that social situations made him very uncomfortable. He didn’t want too much attention, hated to think that people were looking at him, dreaded being called on in class (despite the fact that he always knew the answer to whatever question the teacher was asking) and had absolutely no friends, preferring to spend his downtime on his own, reading or tinkering with some gadget he had invented. Hugo loved to read all kinds of books. But his favorites were The Beanstalk Chronicles by I. M. Jacques. And the final book in the series was going on sale soon. Hugo just had to be the first one to read it! So, he did…and it changed his life forever. “A time machine,” Hugo said, matter-of-factly. The judges looked at Hugo’s project. Standing upright on the table was a sheet of cardboard, folded into thirds and covered with equations and formulae. These, Hugo hoped, would explain the theory behind the object directly in front of the cardboard, which looked very much like a shoebox with a lot of wires and tiny flashing lights attached to it. Mainly because it was a shoebox with a lot of wires and tiny flashing lights attached to it. “I can prove it works!” Hugo said, much more forcefully than he had meant to. Being so smart (indeed, smarter than many grownups in his life) was not easy and Hugo was used to being talked down to by people who didn’t take him seriously because of his age. But he didn’t like it. Hugo put one of the watches into the shoebox and laid the other on the table, outside the box. Then, using a pair of tweezers, he set the dials and buttons on the tiny control panel. Then he stood back. Before the startled eyes of all three judges (and pretty much everyone else at the Science Fair, who had started to gather around as soon as they had heard the words “time machine”), the shoebox disappeared into thin air! “Where did it go?” asked Coach Hartnell. There was a long, painful silence. “Yes. I sent the watch exactly one minute into the future. It will return, in the exact same spot, precisely forty-three seconds from now. The entire gymnasium waited with baited breath as the seconds ticked away. At the exact instant that Hugo had said it would, the shoebox and the watch returned. Hugo took the watch out of the shoebox and held it up along with the other. Hugo stood proudly. He had proved, definitively, that his time machine worked. The judges moved along to the next project. Hugo said “but” a few more times, but to no avail. They were already looking at Susie Johnson’s potato battery. But that's not the end of Hugo's adventures through time! 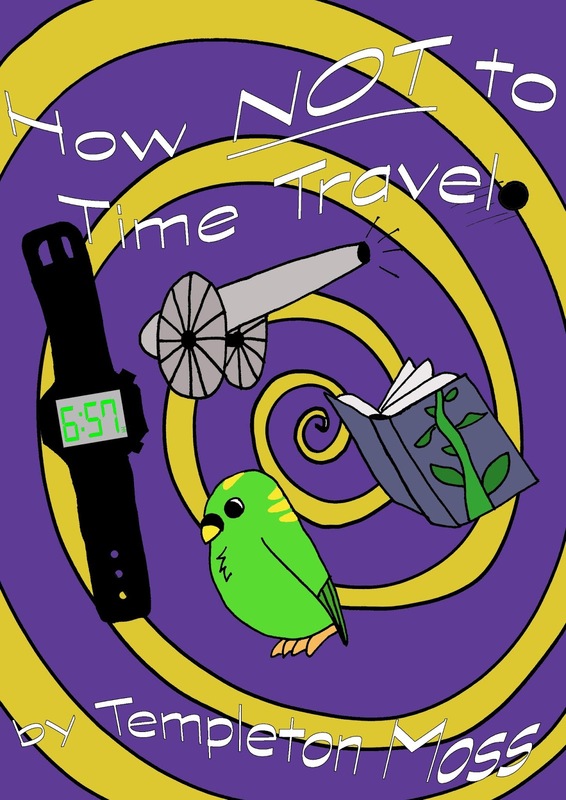 Find out what happens next when How NOT To Time Travel is released in July 2018!